For most people, beach time means lying around in the sun, sipping cold lemonade and just taking it easy, right? Well, it doesn’t have to be like that. Alongside the simple leisure and relaxation, beaches can offer excitement, adventure, and adrenaline. Let’s take a look at some of the top adventure-minded beach destinations that you can visit in the summer of 2018. Have you ever dreamed of flying around with a jetpack? You don’t have to time-travel to finally try it; you can just book a vacation in Mallorca, Spain’s biggest island located off the Barcelona coast. But before we get to that, we should say that Mallorca – also spelled Majorca – offers some amazing cultural and historical heritage to explore, with attractive archeological localities spanning from prehistory to late antiquity. The island also boasts beautiful beaches such as the almost-surreal Cala Agulla, surrounded by pines, mountains and the crystal blue sea. If you’re more into hi-tech adventures, even on the beach, Mallorca’s Port Adriano on the southern coast offers a special attraction – Jetlev-Flyer. It is an actual jetpack with a powerful engine that uses sea water under great pressure to launch you upwards, and to enables you to cruise over the sea surface! Traveling to the Arctic Circle for a beach vacation has a quite high adventure score. Norway is widely known for its incredible scenery, and especially for its stunning fjords. Norway’s Lofoten islands offer all that, and more – they are ideal for hiking, and also feature some beautiful beaches such as the Utakleiv. Surely, it might not be a good starting point for taking a swim, but that doesn’t mean you can’t enjoy yourself. The astounding scenery of remote Northern beaches is an adventure on its own. And you probably won’t be as cold as you’re expecting. Due to the always-welcome effects of the Gulf Stream, temperatures in the summer sometimes reach 20 degrees C, despite the proximity of the North Pole. Portugal is one of the most exciting place on the entire Mediterranean. And the Algarve is its most famous tourist region which has a lot to offer. Algarve’s captivating beaches are surrounded by gorgeous fishing villages on one side, and glorious waves on the other. Apart from the classic vacations made up of relaxing on the beach, sipping cool drinks and swimming, there are a lot of exciting events and activities in Algarve as well. Some of them could even be considered off-beat. For example, an organised cruise from Albufeira focuses on dolphin watching and discovering the hidden caves. It is a great deal for families since it is both fun and educational. By riding the sea on the small but sturdy motorised boat, you’ll be able to reach the otherwise-hardly accessible grottoes of Albufeira’s coast. And dolphins might happen to follow along! 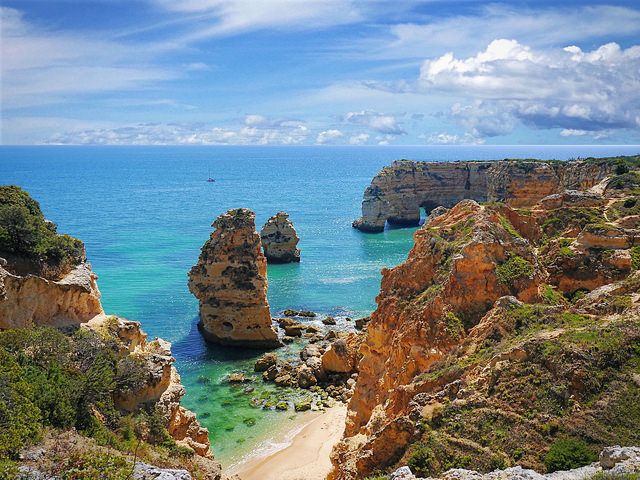 If you’d like a more physical sailing exploration experience, you can find it at Ponta da Piedade. The two-hour long kayaking session allows you to paddle about the locality’s beautiful caves, and Batata, Camilo, and Meia Praia beaches. The experience unites scenery awe with kayaking adrenaline rushes. Attending a music festival is perhaps one of the most radically different ways to spend your day at the beach. Sea Dance is a pop and electro festival hosted at the town of Budva on the coast of the small Adriatic country of Montenegro. This medium-sized festival is said to gather audiences from over 50 countries and features quite a good line up – more than a hundred hot global music acts each year. As for the scenery, while this part of the Adriatic is not really considered premium class, it offers a nice contrast of white sand and turquoise-green sea, all framed by mountains. Hawaii didn’t become a symbol of heavenly vacations for nothing. Apart from the beautiful sun and the blue waters of the Pacific Ocean, Hawaii offers plenty of adventure opportunities. Many of them are found on the Big Island of Hawaii. Big Island is probably the prime surfing hotspot in Hawaii, and perhaps in the world. It was the Hawaiians who actually invented surfing thousands of years ago! In Hawaii, surfing is not just a sport – it’s a lifestyle. If you’re an experienced surfer, you will immediately recognize the amazing potential of Big Island’s waves. If you’re a newbie, Big Island also offers surf classes. Most of the surfing schools are located at a part of the island called Kona. There are plenty more exciting hot summer destinations awaiting you in 2018. Just remember to bring that spirit of adventure along with your suitcases!